Written by Sarah Lazare, staff writer for Common Dreams. Published 10-16-15. Doctors Without Borders (MSF) said that the U.S. military’s forcible intrusion into its hospital in Kunduz, Afghanistan on Thursday potentially destroyed evidence of its war crime and underscores the need for a truly independent investigation into the U.S. bombing that killed 22 people. 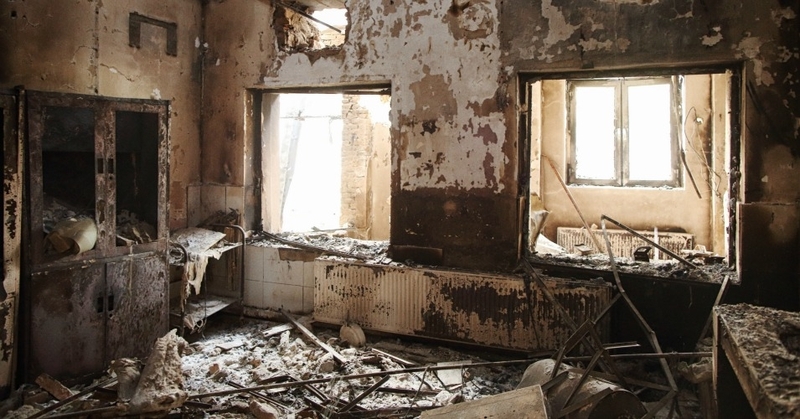 The U.S. bombing of the MSF hospital on October 3 killed 10 patients,12 staff members, and wounded 37 people. The Pentagon acknowledged earlier this month that its Special Forces were responsible for the deadly attack, but only after changing the official story at least four times, including initial denials of culpability and claims of justification. Some have expressed skepticism of the AP report, penned by journalist Ken Dilanian, due to the article’s reliance on an anonymous source to spread allegations that the hospital was being used by the Taliban or its associates. On Thursday, MSF launched a petition “to call on President Obama and the United States to consent to an independent investigation.” MSF press officer Tim Shenk told Common Dreams that the initiative garnered 50,000 signatures in the first 24 hours. While U.S. President Barack Obama formally apologized to MSF for the deadly attack, the U.S. government has yet to consent to an impartial, international investigation. Obama did, however, announce Thursday that he is defying earlier pledges and extending the U.S.-led war in Afghanistan—which entered its 15th year last week—by leaving up to 5,500 soldiers in the country until at least 2017. This entry was posted in Civil Rights, Corruption, Government, Human Rights, Human Spirit, International Agreements, Military, Social Justice, Terrorism, War Crimes and tagged Afghanistan, Atrocities, Civil Rights, Doctors Without Borders, Human rights, International Agreements, religion, social justice, Taliban, terrorism, War Crimes on October 19, 2015 by MNgranny.